The traditional consideration that intelligent behaviors can only be produced from pure reasoning fails when trying to explain most of human behaviors, in which the emotional component has a decisive weight. However, although many different efforts have been made to consider emotions in the rational process, emotion is still perceived by many research areas as a non-desirable quality for a computational system. This is not the case of the field of believable agents, where emotions are well respected, although they are sometimes associated to a certain loss of control. This paper presents the mechanisms proposed by a generic cognitive architecture for agents with emotionally influenced behaviors, called cognitiva, to maintain behaviors control without giving up the richness provided by emotions. 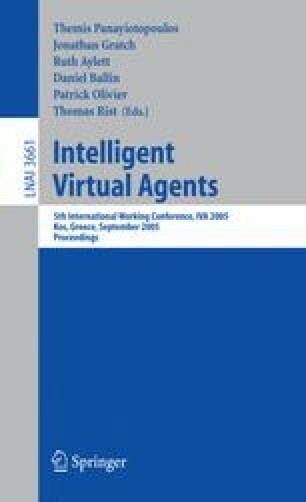 This architecture, together with a progressive specification process for its application, have been used successfully to model 3D intelligent virtual agents.